Prof. Leda Cooks has been named an ISSR (Institute for Social Science Research) Scholar for the 2015-16 academic year. One of only three SBS faculty to be so honored, she will collaborate with the Caring Health Center in Springfield on a project designed to better understand health care experiences. Her research plans are discussed in more detail here. UnityFirst.com, an award-winning national distributor of diversity-related e-news to corporations and diverse communities, has announced that it will recognize Prof. Demetria Shabazz as a 2015 Woman Who Leads by Example in the Commonwealth of Massachusetts. The announcement officially came in the March 28 issue, devoted to International Women's History Month. Prof. Mari Castañeda has been appointed as the first Chancellor's Leadership Fellow and will develop and implement a "Preparing Future Faculty" program at UMass Amherst. Please click here for the full story. 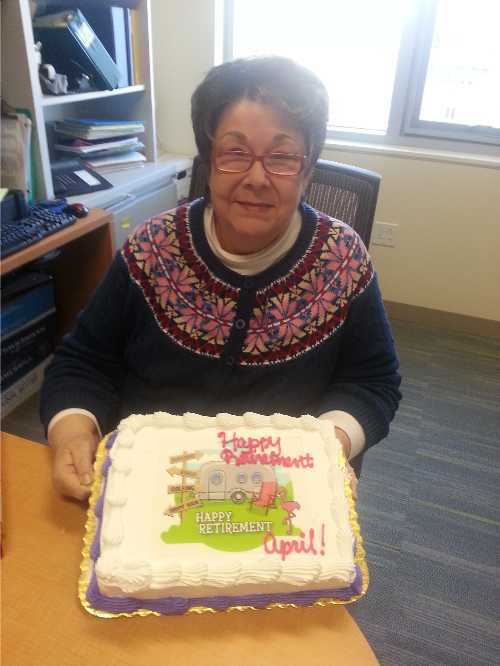 April Tidlund, the Communication Department's undergraduate program secretary and scheduling officer, has retired after almost 50 years of service to UMass Amherst. She has enriched the lives of her many colleagues during those years, and she has always gone the extra mile for the countless students who have sought her help. Please click here for a downloadable photo of our beloved April. The Communication Department seeks applicants for a faculty opening in Performance Studies and Rhetoric, to begin Fall 2015. Application deadline is November 14, 2014. For more information, please click here. The Communication Department invites all Comm alums to celebrate with us in our wonderful new home, the Integrative Learning Center. The Alumni Celebration will take place on Saturday, October 25, at 12:30 to 4 p.m. with dinner to follow at 6 p.m. Guests will have the opportunity to tour the department's new space, participate in a variety of events, and catch up with former classmates and professors.